Hard. So hard. I don’t have the eloquence to properly describe the difficulty of this race. Yes, there was a lot of vertical gain/loss over the 102.9 miles. Yes, it was hot (90s) and humid. And yes, the trails were highly technical even for Rocksylvania. The latter is what really took me by surprise. I had read some prior year race reports talking about this, but downplayed it a little bit. I mean, I’ve run all over PA on technical trails so figured it was just out-of-towners complaining. The difference between these trails and the rest of the state though would be the amount of loose rock and it’s prevalence on the downhills. Your feet were constantly shifting once they hit the ground, which lead to movement within your shoes which lead to . . . well, let’s not get too far ahead of the story. Basically, it was probably a combination of all those things that made the ES100 this year so hard that only 1 in 3 of the 196 starters finished. The other thing that made this race so difficult for me is that I was mentally battling cutoffs the entire way. While I was never right up against the edge of them, I was never more than 2-2.5 hours ahead at any one point. This left me very little margin for error as the race progressed and my pace continued to slow down. As a mid to slightly in front of mid-packer, I’ve never given much thought to cutoffs in other races. Consequently, I wasn’t quite prepared for how emotionally draining this could be. Add it all together and by the end I had decided I was never going to run another 100 mile race. It was just too much. I hurt. I was bone weary. I wasn’t having fun. I was even already working on what to change the meaning of this blog to (initial thought was 10k ultra miles from 100×100 milers). What was the point of paying good money to put myself through this? Me at the 5am start. Do I look nervous? It’s taken me the better part of 18 months, but I’m finally starting to figure out why I run 100 mile races. The first realization coming out of ES100 is that these races boost my self confidence. Now it’s true I didn’t lack from confidence before I started running ultras, however I find the challenge of these races a great benefit in this regard. Why increase my self confidence? I see this as the secret sauce of success (try saying that 3 times fast!) in life. Successful people aren’t self confident because they’re successful. I believe self confident people become successful. Confidence is what gives you the ability to reach higher and try harder in life as it provides a buffer against failures. Now no one can give you self confidence. You have to earn it for yourself over time. I view it as a wall of stones that you build higher with each challenge you successfully navigate. Study hard and get an A on your test? Add a stone to the wall. Set up a date with the new girl that just moved in down the block? Add another stone to the wall. Land your first real job out of school? Roll up a boulder to the wall. The more you add to the wall, the easier it is to build it higher. The only way I was able to even dream about running 100 mile races in the first place is because I had a pretty large wall of self confidence already constructed. I knew that shooting for the stars and falling short wouldn’t be the end of the world. And it’s also the reason why my DNF at C&O in 2015 didn’t drive me away from the distance. Self confidence makes everything easier as it takes the worry out of life. It doesn’t mean you won’t encounter down times, however it provides you the knowledge that you can tackle any problem that comes your way. So I look for every opportunity to build my wall a little higher. One of the less technical sections of trail. My other realization is that these races help me better understand who I am. I live in an environment that provides so much support (physically, mentally, emotionally, financially), that it’s sometimes difficult to separate myself from everything else. 100 miles strips that all away and shines a spotlight on who I am and what I can accomplish. That’s not to say I don’t have support during the race. Kate did a great job crewing me and the aid stations were welcome oasises (oasi?) throughout the entire run. It’s just that the level of support is quite modest compared to the effort involved. Am I the type of person that can create a solid race plan and execute it on race day? Historically, no. That’s not who I am. I come up with good pacing plans and then toss them out the window by mile 4 or 5. But on Saturday and Sunday, I ran the best race ever for any distance. My goal was to start easy and run within myself. The first mile is entirely downhill on a paved road. I started in the middle of the field and slowly moved backwards so was one of the last 10-15 people onto the single track trail even though I ran a mid 10 minute mile. The next couple miles was pretty flat so I had thought I would be able to crank out fairly easy 13 minute miles in through here and start building up a nice buffer on the cutoffs (21 minute pace). Well, I had no idea how technical the trails were going to be. When I say technical, I mean 12-18inch wide trail with inclines/declines on each side and littered with rocks of various shapes and sizes. In the dark. So instead of running this section, I walked it with everyone else at a 15-16 minute pace. This was followed by the first major climb of the day resulting in 21 minute and 20 minute miles. With my dreams of building a quick 30 minute buffer over, I quickly shifted mental gears. The goal now was to grind out easy 16-17 minute miles. And I was able to do that throughout the first half of the race. Some miles were quicker than that and others slower, but I was continually adding minutes to my time bank on the cutoffs. There was a 2 mile section of trail around miles 19-20 that was entirely downhill. And gently downhill at that. In prior races, I would have cranked out a couple quick 9 minute miles, but not this time. I was thinking strategically at this point and was carefully walking every several minutes to save my quads for later in the race. People were continually passing me through here and I ended up giving up some of the places I had picked up over the first part of the race, however this was definitely the right decision for me. My quads were pretty wrecked by the end and I can’t imagine how much worse they would have been if I hadn’t been taking it easy here. My focus during the entire race was on finishing, not on any given time. I have no doubt that if I had been trying for a certain time (i.e. sub 30 hours), I wouldn’t have finished this race. 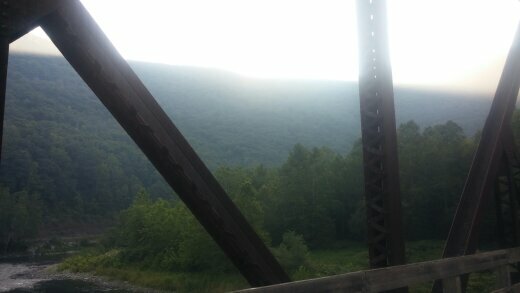 Sun coming up over the mountain as I cross a trestle bridge. This theme of me getting passed continued for the remainder of the day. The slightly discouraging thing was that it mostly ended up being the same people passing me over and over again. I focus on getting in and out of aid stations as fast as possible. So mostly I run in, grab what I need (water, gels, salt tablets), and am out within a minute or so. Others will run in, peruse the aid station table, sit for a spell, and then be on their way. 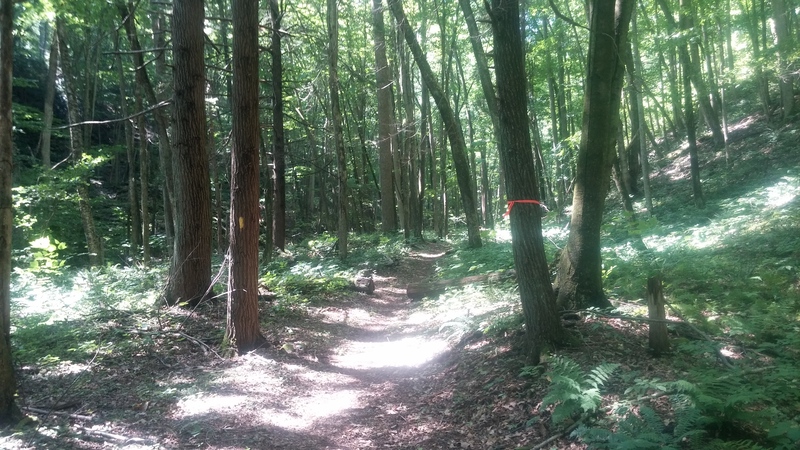 So 90% of my passing was done at aid stations, while others kept flying by me on the trails. Whatever. I really didn’t let it bother me. I knew I was running the best race of my life and never for a second let what others were doing impact me. I really hope I can remember this in future races. When I looked at my splits on the live tracking site, I was actually pretty shocked at how steadily I gained places over the course of the race. Obviously, this was due to others dropping out rather than me blazing past them. A nasty thunderstorm blew through in the afternoon. And of course it happened while I was on a rather exposed ridge section. I heard it coming up behind me and kept looking back every couple minutes to judge it’s progress. Then all of a sudden it was on top of me and the 2 others I was running with at the time. The wind picked up to huge gusts, rain started coming down in huge sheets, and the temperature dropped about 10 degrees in a matter of seconds. Then the lightning started falling. Luckily, I had reached a gentle downhill section so was able to run and it was only a couple minutes that I was out there in the open. I thought I would be safer once I reached the forest proper, however the lightning was still coming down around us. I think one touched down only a couple hundred yards to my right because I was blinded by the flash of light at the same time the sound of thunder reached my ears. I may have dropped an expletive. The storm only lasted about 30 minutes or so, but it left a lasting impression. The couple steep downhill sections I ran during this time were twice as slow with the water and mud. I would be willing to bet the year this race gets a lot of rain, the number of finishers will be in the single digits. We crossed streams like this all day. None so deep you couldn’t hop across on rocks though. Somewhere around mile 40 my right knee started giving me some problems. Nothing that didn’t keep me from running and I don’t believe it materially impacted my stride mechanics, however it was a bother. I had an Ace bandage in my main drop bag at Halfway House (mile 54) and a knee brace in my third drop bag at Blackwell (Mile 80.3). I used them both and they helped a little bit, but my entire right leg is still swollen as I write this almost a week later. I can’t even remember what I did to injure it. My guess is that all the uphills put more of a strain on it than it could bear. I’m going to start using trekking poles in future races so hopefully that will help. I don’t remember much of the night. I never can. I remember running into Slate Run (mile 63.8) somewhere about midnight. It’s at this large house, however the markings out front leading to the aid station were only meh so I was a little confused. Well, I was a little confused because I was tired and had been running for 19 hours already. I got directions and met up with Kate around back for the first time in 4 hours or so. I wasn’t getting drowsy yet, but wanted to be prepared for the remainder of the night so I asked for some coffee to go into one of my water bottles. I got the strangest looks from the aid station workers so I’m guessing they don’t get this request very often. I laughed and said this is why I carry 2 water bottles. I can’t stress enough the benefits of carrying two 20oz bottles. Not only does it provide you a flexibility of fueling options, but it also saves countless time in aid stations. You don’t need to spend 10 minutes in an aid station drinking coffee or chicken broth or whatever strikes your fancy. Just toss it in your To Go cup and off you go. This trick easily saves me 20-30 minutes a race. The only downside is if you crave different things at different aid stations and can’t adequately get one bottle washed out well enough. I always make sure one bottle is 100% devoted to water and deal with whatever extra tastes are left in my second bottle. 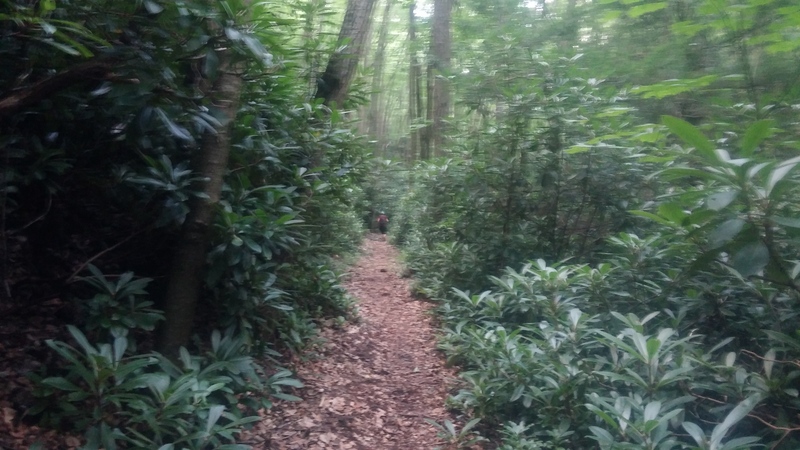 I only snapped pics of the easier trail sections because I was too fearful of falling down on the harder stuff. Trust me, there was tons of it out there! 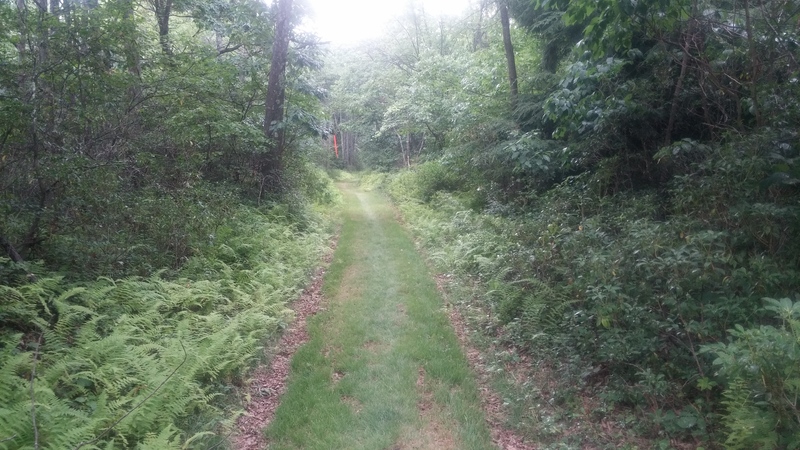 It wasn’t too long after I left the Long Branch aid station (mile 75.6) about 5am, that my feet started hurting. The odd thing is that it happened to both feet at about the same time. The bottom of each foot became a burning pad of coals each time I took a step. It took me ninety minutes or pure torture to reach Blackwell. I had been counting down the time till sunrise to a limited degree. I had thought that the light would brighten my spirits, however that wasn’t the case. If anything, the reverse happened as I slowly trudged down the trail. I was still making OK time (22 minute pace), however I just couldn’t imagine spending another 10 hours in this discomfort. Between my feet and knee, it was just too much. But I remembered Phil’s Lesson #1 of running 100 milers, which is never decide to quit in between aid stations. So I planned to get into Blackwell, have them take care of the blisters on the bottoms of my feet and then make a decision. Am I the type of person who takes the easy way out and drops? Or am I the type of person who rises to a challenge? And at that moment a wave of euphoria washed over me as I knew beyond a shadow of a doubt who I am. I didn’t start magically running, but I was now back in the game. I rolled into the aid station and immediately asked if someone could take care of my feet. The medical professional was finishing up on another runner, but soon was at work on my 2 feet. You should have seen the look of incredulousness that crossed my face when I took my shoes off and looked at the bottoms of my feet. I was expecting to see a mass of blistered destruction, but instead they were just a little red. My mind was boggled that something could hurt that bad, but look that good. I get blisters every now and again (I actually had 2 or 3 elsewhere already), yet they never seem to cause me much pain. The fact these hotspots almost took me out of the race would have been extremely ironic. After I got things situated, Kate started walking me out of the aid station. We were a couple hundred yards up the road when I realized I had forgotten to grab my knee brace. I had taken the Ace bandage off before getting into the aid station to see if I could run without support. The answer was yes, but it was better to have a little support than none. So I sent her running back to the aid station to grab it and catch back up with me. I had taken a couple steps when I remembered you’re not allowed to receive aid outside of aid stations. Arrgggh! Am I the type of person that cuts corners when pressed? Sigh. No, I follow the rules. 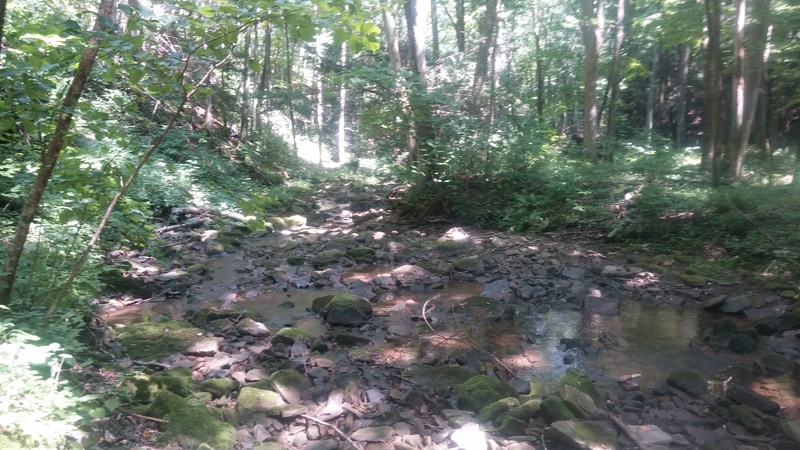 So I turned around and jogged back down to the aid station. I sat down in my recently vacated chair, grabbed the knee brace, put it on quickly, and then once again started the walk up and out of Blackwell. I doubt anyone would ever have known if I had gotten the knee brace a mile up the road. And I’m pretty sure they wouldn’t have taken me out of the race for such a minor transgression. But right is right regardless if anyone knows besides myself. Total time lost was only 5 minutes or so. At this point, I had a little over 10 hours to cover 22 miles. I wasn’t really running, but I had plenty of time. I just couldn’t afford to spend too much time in any aid station. The next section to Sky Top was almost all uphill so it took almost a 26 minute pace to “run” the 4.5 miles. This knocked about 20 minutes off the time I had banked, however I wasn’t too concerned about the cutoffs any more. I had a little over 2 hours to play with as I left Blackwell so could afford to spend some up. I took another 10-15 minute break at Barrens (mile 92.8), which was the last crew accessible aid station purely as a treat to myself and because I could afford to. There ended up being only 2 decent sized hills over the last 20 miles. The funny thing was that it ended up taking me longer to go downhill than uphill. The last mile of the race drops about 1000 feet straight down in about a mile and I was moving painfully slow. I passed one runner and was passed by another, however was surprised many, many more didn’t come flying by me here. And then I was down. I crossed the road and turned up the short section of parking lot to the finishing straight. It was pancake flat, but I was going to walk it all the way in. I couldn’t think of a reason to run until I heard cheering for a runner behind me. Drat! There was no way I was getting passed within sight of the finish line. So I started to run. Well, it was a running motion, however the speed was closer to a septuagenarian shuffle. After about 15 seconds I started getting a little concerned about whether I could keep even that up for the entire 150 yard finishing chute. And whether I would get passed regardless. I managed to run it in (without getting passed) and then it was finally over. After a day and a half, I could finally stop moving. I was emotionally and physically spent to my core. I never want to do a race that hard ever again. But I did learn something about myself last weekend. 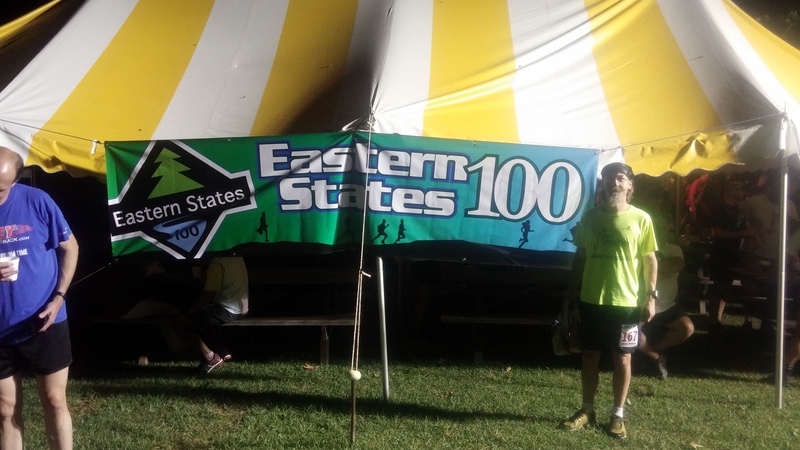 I’m an Eastern States 100 finisher. And the Wall is now a little bit bigger. Great post. Thank you. Ill be running it for the first time i 2017. This mindset or mantra of who am i will help… i hope! Kevin, Thanks for the comment! Like a moth to a flame, I’m being pulled back to ES and will be running it again in 2017 as well. Hope to see you there! Want to do this …. what are the chances of getting in off the wait list currently at 65 people? George, I don’t have any experience with the waitlist so not sure how likely one is to get in. I found the RD to be very responsive to my inquiries about the race last year and would guess he’d be able to give you some idea based on the past couple years. Sorry I couldn’t be more help! Thanks for the race report. Very insightful. One of the better reports that I’ve ever read. I ran last year and DNF . Missed cutoff, arrr. But I am back for 2017 stronger, and faster, new strategy. PS- going it alone, No crew no pacer so hopping to daft other runners. I’ll be without crew and pacers this year as well. Look for the guy with the long, goofy mustache as I’ll welcome any and all company I can get. Sounds like an awesome finish! Careful about swearing off ever running it again. Been there, done that, ran it again. Race report as soon as I regain coherent thought. Thrilled to have finished in 2016 & last week. Went no crew or pacers in 2017 & will do the same next year!